Ethan Diamond, co-founder of the pioneering webmail service that became Yahoo! Mail, today lifted the veil on his new startup and gave me an exclusive first look. Bandcamp is a free hosted publishing platform for musicians, taking the technical challenge out of setting up a site — transcoding music into different formats, streaming audio, analytics, payment processing, and so on. Band websites are often pretty bad, hacked together by a friend of the band with Flash and Dreamweaver, or worse, by the record label. There are exceptions, but mostly, it’s a sea of Flash intros, popup windows, mystery navigation, and 30-second sound clips. Bandcamp is trying to change that, giving every album and track its own page with clean URLs and semantic markup, with the accompanying SEO benefits. Even before launch, they’re topping Google results for many searches for song titles of participating bands. As an infoviz geek, I’m particular fond of their analytics and audio visualizations. Detailed stats let bands track recent activity on their songs and albums, including where people are coming from, trend tracking, and which songs were skipped, played partially, or played in full. A number of real-time audio visualizations in Flash are available on each song’s page, which can be shared and embedded on other websites. Like Oddpost, the team’s small and nimble — only four people, all splitting engineering and design duties. Co-founder/CTO Shawn Grunberger (also formerly with Oddpost and Yahoo! Mail) and two engineers working from Seattle and Vermont round out the distributed team. Ethan was kind enough to sit down with me on launch day to talk about their inspiration and process developing Bandcamp. Before reading the interview, I’d recommend watching the screencast. This is a big departure from Oddpost and Yahoo! Mail. How did you decide on building a site for musicians? Ethan Diamond: Well, we started Oddpost in 2000, so by the time I left Yahoo I’d been working on email for seven years. That felt like plenty. Then, earlier this year I was trying to download the new record by one of my favorite bands, and they were trying to sell it from their own site, but just flailing. I wanted to build something to help them out. I assume you’ve been talking to a bunch of bands… Do you have any sense why band websites are so mediocre? Well, Flash is pretty seductive, but it has, unfortunately, ruined plenty of band sites. Not just from a UI perspective, but more importantly from a search engine/discoverability point-of-view. A big part of what we’re doing is making sure that when people search for you, they find your site first, and not the dozens of other places where you happen to have a limited presence. Another factor is just time and money. Musicians could figure all this stuff out, but then they’d be in my shoes — good at the tech stuff but lousy at the music. We want to let them focus on their music. It seems like the norm for new bands these days is to only have a Myspace page, and skip the homepage entirely. The Visible Men, for example, only had Myspace before they came to Bandcamp. What I’m seeing is a bunch of artists who want to own their web presence, so they register their own domain. But then they end up putting together something half-baked, or nothing at all, and just pointing to their Myspace page instead. And it’s not because they love their Myspace page (the opposite is true). It’s because a decent alternative just doesn’t exist. I wonder if the best fit for Bandcamp will be new bands with no existing web presence at all. That’ll be an easy one, for sure. But we’ve been finding that artists with their own domain, their own presence also have a music section that’s seriously lacking. Usually just some links to MP3 files and then a link over to iTunes. 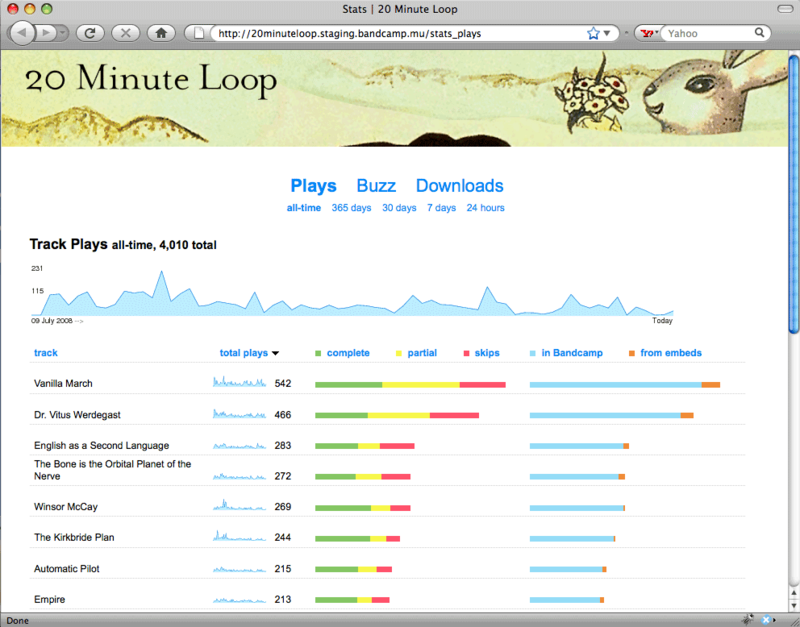 Check out the way 20 Minute Loop points their music section at us. Same with Los Rakas and The Cataracs. The integration isn’t as tight for those last two, but it shows that they’re amped to point to something they feel is their own. I’m amazed that there’s so little competition. There are several self-hosted band CMSes, and some pay services, but very little that’s free and hosted. One of the few I could find was Speakerheart, which is an all-Flash nightmare. It does sometimes seem like giving each track and album its own URL is a radical concept. Lyrics sites do that, for obvious reasons. Yep, and their consistently high search results demonstrate the power of it. On the subject of copyright, what’s to prevent Bandcamp from becoming the next Muxtape, with people adding music that’s not their own? In theory, nothing. But there’s a bit of a natural barrier there, because we require audio files to be in a lossless format, meaning uploads take a bit longer. So I don’t expect the sort of casual MP3 uploading that would make that a problem. And of course, we’re presenting ourselves as a publishing platform for musicians, not a mixtape service for fans, so that positioning should help as well. And then there’s the fact that our copyright policy requires you to own the rights to the music you upload, so if you don’t, it’ll just get taken down. I love that you’re requiring lossless, and then handling all the transcoding, ID3 tagging, and file renaming for the artists. That’s a significant time-saver. Technology stack, baby! But yes, the transcoding and ID3 stuff is getting lots of good feedback from the artists we’ve shown it to — that’s one of those things that they just shouldn’t ever have to worry about. I want to talk a bit about your own personal philosophy towards music, which pervades the site. There are no 30-second clips on Bandcamp, only full songs, and you have strong support for free and pay-what-you-like music. Do you think music wants to be free? I think fans want to support the artists they love, and our approach is to help enable that. Support means different things to different people. For some, it’s getting the CD or paying for the download, for others it’s going to the show, getting the t-shirt, poster, and so on. But we pretty much stay neutral on the should-music-be-free question, instead putting the control in the hands of the band. They get to decide whether they want to sell their downloads, they get to decide whether it’s going to be a set price or name your own, they get to decide whether to sell a physical CD. The one exception to that is, as you mentioned, streaming. We require full streams, not 30-second samples. To paraphrase Andrew Dubber, music is unique in that it’s always listen-like-buy, never buy-listen-like. Contrast that with going to a movie, which is buy-watch-maybe like. So you need to let a fan hear the song if you’re going to get them to buy it &mdash whether that’s buying the disc, the digital download or just coming to your next show. 30 seconds just isn’t enough time to make that sale. Bandcamp’s design aesthetic is very different from the pixel-perfect Windows-like UI of Oddpost. Can you talk a little about what informed the minimalist design? We started working on Oddpost in 2000, and there really wasn’t such a thing as a web application at that point. (With a few minor exceptions like Halfbrain, where Shawn and I also worked.) And Ajax was still called DHTML, and we walked to school uphill both ways, etc. So part of the very app-like design came from the fact that we wanted to demonstrate that a web page could not only have some app-like features (e.g., drag and drop), but actually be mistaken for a desktop app. Back then, we even opened the app into its own window, so we could have our own menubar that didn’t compete with the browser’s. Even though we were trying to emulate a desktop app, we still had the same minimalist approach that we’ve always had, drilled into my head by Tufte seminars and books back in our Adobe days. So we really tried to pare down the UI, but yep, it was very much a desktop UI still. So we evolved that idea, and now we’re trying to apply the same sort of minimalist approach to Bandcamp and much simpler (from a UI perspective) web pages. Related, what did your design process look like? Wireframes on paper? I start with pencil and paper wireframes, just for the speed of it, and then mock those up in Illustrator and post annotated screenshots to our internal wiki. Then we all comment in the wiki, and do a live discussion over IRC. We abandon the screenshot-iterating pretty early on in favor of just-building-it, and that’s worked really well for us. I love the Flash audio visualizations. I think it’s the first time I’d ever seen anyone do that alongside an embedded MP3 player. This is custom stuff written on top of Flash’s AS3 functionality, done by a fellow named Justin Windle. Our plan is to open up the API so that people can write their own visualizations, but that’s a ways off. Okay, last question! What’s it like going from a 6-person startup to a 15,000-person behemoth like Yahoo!, and then back to a 4-person startup? That sounds about right. Thanks, Ethan! Bandcamp is live right now. Pass it on. This sounds awesome, Ethan! I can’t say I totally understand all of what I just read and heard, but go, baby, go! Congrats! So it’s all free to bands? Does bandcamp use adsense or something to capture some revenue, or do they just take a cut of digital download and CD sales? Their FAQ covers that question in detail. Essentially, they’re planning some short of revenue share with artists (whether advertising or song sales), but they haven’t decided yet. They said they won’t be taking a revenue cut for at least the next six months. From the FAQ it looks like domain mapping and about pages are coming, which I think are the only glaring things missing. They laugh at the graphic equalizer, but it would be nice to see some visualizations with real meaning. Great interview. Particularly liked his reasoning behind full streams of songs. I’m thinking Pandora’s recent troubles would go away if the music industry would recognize this common sense logic. re: laughing at the equalizer, I think they were poking fun at the fact that the myspace eq graph is totally fake and has no connection to the music. Wow, I was just about to completely overhaul my music site so I could sell MP3’s, but Bandcamp looks to be a much better solution. Thanks for bringing this to my attention, Andy! I’m on board. Great scoop / great interview. Looking at the Bandcamp, I have to say that they are doing a lot of great stuff–and doing a lot of hard stuff in a great way. Having been stuck this week on trying to build half of these features on my own band site, I am impressed and somewhat envious. This is by no means a slight on Bandcamp, because it’s important that there are sites that handle all of the technical and design things for people who wouldn’t otherwise be able to do something on their own. But, I am kind-of bummed that this isn’t a tech stack / service that let’s me go off and create features like these on a site of my own design. Great concept! Tell Neal I said hello, and holla at a brotha when you need some QA. Was there any connection between Ethan and Ian C Rogers when there were at Yahoo!? Seems like Topspin and Bandcamp would go quite well together. It’s just like Ethan to recognize an enormous hole in the cultural landscape and then fill it with elegant, rigorous design aesthetic and a signature wry sense of humor. Great interview with one of the most influential B.M.F.s of cyberspayce. Looks pretty from the preview film, i have to admit. But whats the point with all these different quality options? and its nice to have a visualiser…if it actually works (which it didnt on my computer). And as an independent artist, how much money am i potentially gonna make of this? pooled advertising revenue which is divided up on a point system? doesnt sound like i will make alot. If I have 1000 plays, what does that give me? Can this service get me on Itunes? Confident he’s proceeding to experience a very good read.